Spinal decompression therapy is FDA cleared and has a high success rate for pain associated with herniated or bulging discs…even after failed surgery. It is a non-surgical, traction based therapy for the relief of back and leg pain or neck and arm pain. The goal of this is procedure is to create a vacuum effect within a disc. This is achieved by isolating a disc and cycling through distraction ad relaxation. This creates a negative pressure or pump within the disc drawing fluid or herniated material into the disc. The key healing a herniated disc injury starts with getting pressure off of the nerve and drawing herniated material back into the disc. Because spinal decompression creates a negative pressure within a disc, the disc material that protrudes or herniates to the outside of the disc can be pulled back in to the normal confines of the disc. This allows healing to occur. Isn’t Spinal Decompression Therapy the same concept as regular traction? Muscle guarding is a problem that regular traction devices cannot prevent. Muscles have a reflex to tense up or guard once they feel threatened. Once this occurs the patient no longer receives any positive benefit from traction. The SpineMed Computer is the key. It measures 1000 times per second if the muscles are tensing up. If the muscles guard the computer eases off the traction until the muscles relaxes. In other words, the computer finds a sweet spot where we can turn the disc into a pump without fighting the muscles. What makes someone a candidate for Spinal Decompression Therapy? If a disc is damaged it must be rebuilt before a patient can move forward. When I say damaged I refer to people with herniated, protruding or bulging, spinal stenosis, or degenerated discs causing sciatic or radiculopathy (pinched nerves). When is Spinal Decompression not the answer? If someone has “hardware” (screws, metal plates, or cages) we generally do not suggest Spinal Decompression. There are a few exceptions. However, spinal decompression can be performed after bone fusion or non-fusion surgery. Are the sessions painful, how many will be needed, and what is the cost? In most cases, the treatments are completely painless. 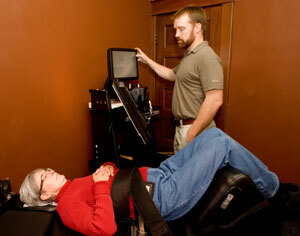 In fact, many patients fall asleep during the spinal decompression session. The worst case scenario is occasionally someone will be stiff after the first or second session. No one will argue the fact that no two people are alike and no two injuries are the same. In the same manor no two treatment plans are the same. We evaluate each patient and put together a care plan that best meets their needs. The good news on the cost is we always strive to achieve people’s health goals in the fewest number of visits. If necessary, we provide several payment plan options to enable everyone to receive the care that they need. The doctor will determine if you are a candidate for care on the initial consultation and fully explain the costs before you receive any care. If the doctor finds that you are not a candidate for care there will be no charge for your initial consultation. Sound fair? When you compare the success levels and treatment outcome to the cost and risk of steroid injections ($500 to $2500) or the cost and risks associated with surgery ($50,000+), spinal decompression should be your first choice. It is easy to determine if you are a candidate for spinal decompression therapy. All it takes is a phone call to set up a complimentary consultation with the doctor. Make sure to bring any MRI reports for the doctor to review and give you the best advice on your treatment options.